Not really the picture I was planning, but I suppose it does show something that is not possible on other preserved lines - a passing shot. Class 421 4-BIG 7059 (actually 4-CIG 1393 with the reinstatement of a buffet car) is propelled towards Quorn & Woodhouse on the Great Central Railway by Class 33 D6535, whilst working the 5C30 14:35 ECS from Loughborough. Meanwhile, D8098 gets in the way as it heads north 0C32 14:13 Rothley to Loughborough light engine move. 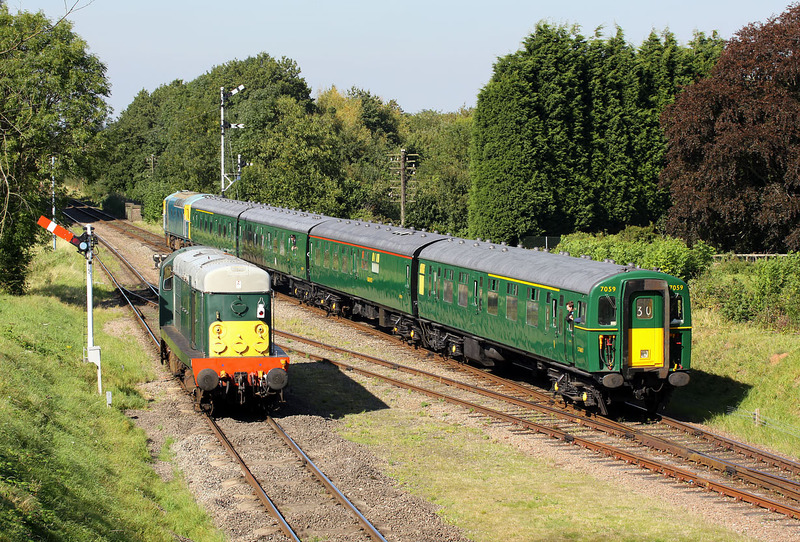 This was during the Diesel Gala on 12 September 2009.